Ice Cream Cupcakes are a childhood favorite. Some of my favorite memories were baking this party dessert with my mom. This Ice Cream Cupcakes recipe features an authentic bakery approved cake recipe topped with a sweet vanilla buttercream frosting recipe. Name a more classic combination than cake and vanilla ice cream- I dare you! Name a more classic combination than cake and vanilla ice cream- I dare you! 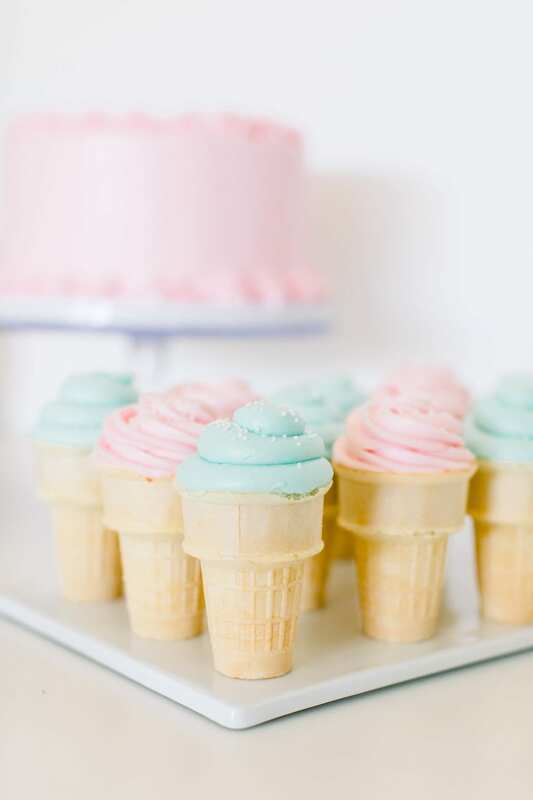 These ice cream cone cupcakes combine the best of both worlds with classic vanilla cake and frosting styled to look like the most delicious ice cream cone! 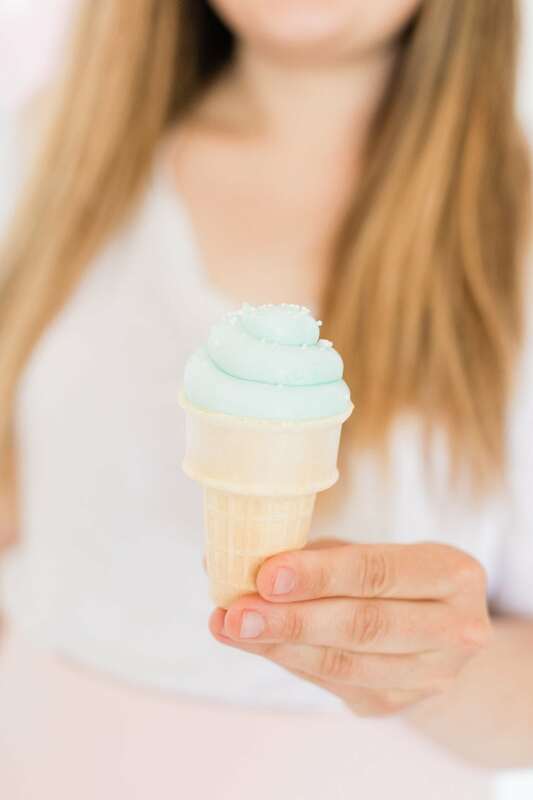 This is the PERFECT dessert for any kid’s party as it can be customized to suit any theme or holiday- and the cone makes it perfect for little hands to hold! 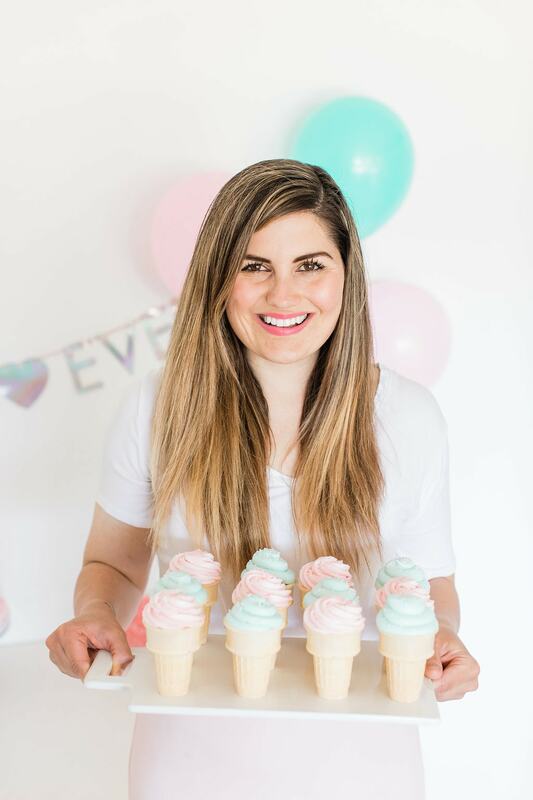 I recently hosted a Princess Party and enlisted my friend Ashley of Peace Love & Eat Cake to share her secret recipe to make these ice cream cone cupcakes. When it comes to party desserts, cupcakes have always been my go to! They are a guaranteed crowd pleaser and can be customized to suit literally any occasion. Plus, they’re so fun to whip up! I always have the ingredients for classic vanilla cupcakes and frosting on hand in case I need a last minute dessert that I am positive will be a hit! Though I love any and all kinds of cupcakes, I’m always searching for new and fun twists on this classic dessert to avoid recipe burnout. 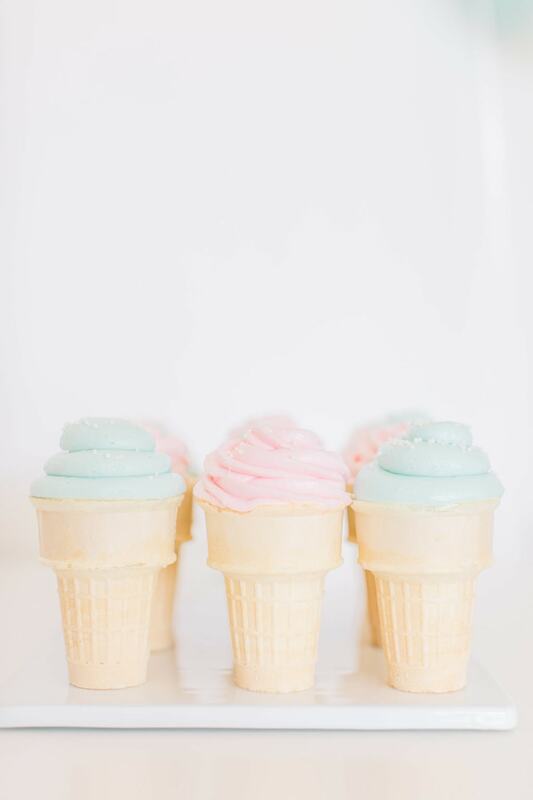 These super cute ice cream cone cupcakes are such a fun, whimsical way to freshen up the classic vanilla cupcake! I’ll admit that I still haven’t met a dessert I didn’t like, but some of my all time family favorites are cake and ice cream. Basically these ice cream cupcakes combine my top two desserts to make these adorable ice cream cone cupcakes! 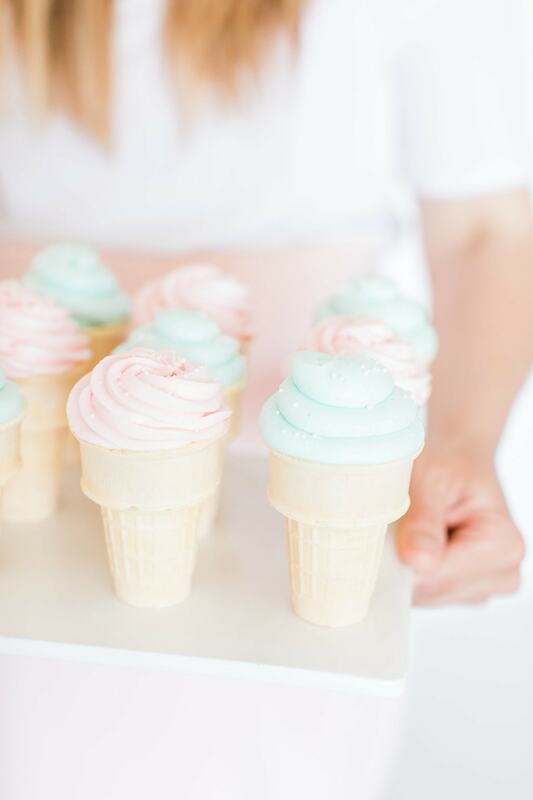 These are seriously just classic vanilla cake with vanilla frosting, placed in a cone and frosted to look like a delicious ice cream cone! What could be better than that? These cupcakes are the perfect dessert to bring to any birthday party, holiday party, back to school night, fundraiser…the list goes on! I absolutely loved the adorable girly pastel colors of these cakes, but you have total freedom to use your creativity and customize the color of your frosting to make your cupcakes perfect for any event or holiday! The sky is truly the limit. To make these cupcakes, the process is super simple- another win if you are rushing to throw together a cute dessert in time for a party! I promise these cupcakes are so easy and fun to make- and the end result will seriously make you look like a master cake decorator. No one will ever know just how quick and easy these are to make. ;) Begin by making your vanilla cake (and maybe even sneaking a few tastes of the batter-shh!). Once you’ve baked the cakes and allowed them to cool on a wire rack, cut them into rounds to fit into your ice cream cones. This part may sound daunting but trust me, a round cookie cutter makes this task a piece of cake- literally! :) Cut the cake into rounds to fit the size of your ice cream cones and place the cakes inside. Your ice cream cone cupcakes are now ready to present and serve! These cupcakes are so cute, I pinky promise that they will be a huge success no matter where you take them! The classic vanilla flavor makes them an all around crowd pleaser- and the best part is that they are SO easy to make! No baking genius required here! These cupcakes have so much potential for creativity and customization- I can’t wait to make these for a back to school night or neighborhood get together soon! Ice Cream Cupcakes are a childhood favorite. I have warm memories baking this perfect party dessert with my mom as a little girl. This homemade cake recipe and vanilla buttercream frosting recipe is sure to be a crowd pleaser. 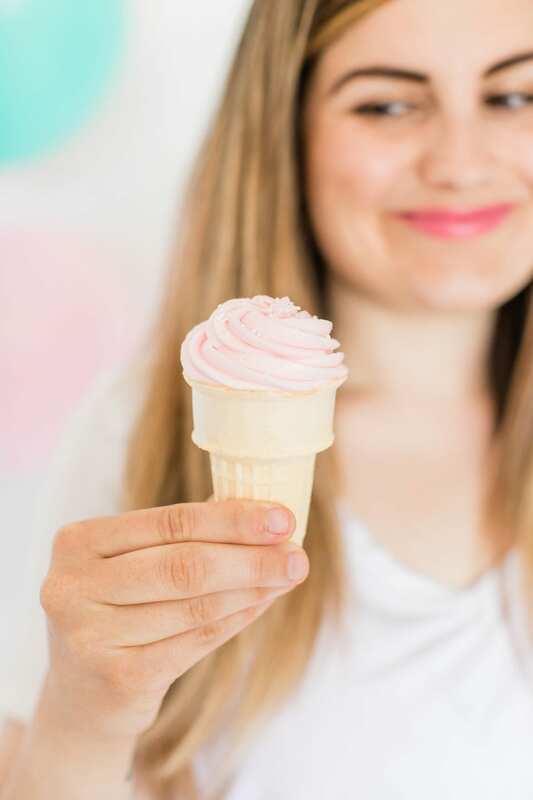 How to Make Ice Cream Cone Cupcakes -Using a round cookie cutter, cut rounds out of the cake layers so that cake fits into the ice cream cone-Once all cones are filled with cake, frost using Vanilla Frosting recipe, using preferred tip -Finish with choice of sprinkles-Enjoy! Best Frosting Recipe for Piping on Cupcakes. Make this easy frosting recipe in minutes. It’s an authentic bakery approved frosting recipe!